Monash researcher Dr Ros Gleadow and her research team have received international recognition for their research into cassava and climate change. Dr Gleadow's research showed that staples such as cassava become more toxic and produce much smaller yields in a world with higher carbon dioxide levels and more drought. The findings were published in the peer reviewed journal Plant Biology. Dr Gleadow's team tested cassava and sorghum under a series of climate change scenarios to study the effect on plant nutritional quality and yield. Both species belong to a group of plants that produce chemicals called cyanogenic glycosides, which break down to release poisonous cyanide gas if the leaves are crushed or chewed. The team grew cassava and sorghum at three different levels of CO2; just below today's current levels at 360 parts per million (ppm) in the atmosphere, at 550 ppm and double at 710 pm. Current levels in the air are approximately 390 ppm. "What we found was the amount of cyanide relative to the amount of protein increased," Dr Gleadow said. "At double current CO2 levels, the level of toxin was much higher while protein levels fell. The ability of people and herbivores, such as cattle, to break down the cyanide depends largely on eating sufficient protein. Anyone largely reliant on cassava for food, particularly during drought, would be especially at risk of cyanide poisoning." 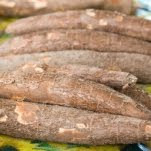 "While it was possible to use processing techniques to reduce the level of toxin in the cassava leaves, it was the 50 per cent or greater drop in the number of tubers that caused most concern," Dr Gleadow said. About 750 million people in Africa, Asia, and Latin America rely on flour made from cassava tubers as a staple The findings underscore the need to develop new cultivate to feed rapidly growing human populations. "Reducing carbon emissions wouldn't be a bad idea either," Dr Gleadow said. Dr Gleadow's team comprises scientists and researchers from Australia and Mozambique, including her collaborator Dr Tim Cavagnaro from Monash and Dr John Evans (ANU).